Video clip synopsis – Islamic art, the Tahitian islands and the circus all provided inspiration for French artist Henri Matisse. Broadband MP4 hidden2_bb.mp4 (17.4MB), suitable for iPods and computer downloads. Matisse & Islam is an episode of the series Hidden Treasures (15 × 5 mins) produced in 2006. Islamic art was a major inspiration for French artist Henri Matisse, who loved the interdependence of its shapes. The arabesque in Islamic art stands for the vulnerability of life, which can be bestowed or withdrawn at any moment. The positive forms of the arabesque create the negative shapes of the spaces in between; these empty spaces symbolise that which 'belongs to God'—the permanent but invisible reality of the divine principle. Similarly for Matisse, what remains belongs to God. Of his belief in a higher power he said, 'When I work I feel myself helped immensely by someone…It is as if I were watching a conjurer whose tricks I cannot see through’. Matisse discovered the opulent colours of Islam in the textile bazaars and souks of Morocco, which he visited in early 1912. His ancestors had been weavers for generations and he was supremely confident with scissors and cloth. So when severe illness in his 70s confined him to bed—away from his paints and brushes—he naturally took to scissors and coloured paper. One night when he couldn’t sleep, he cut a swallow from white paper and asked his nurse to pin it over a dirty patch on the wallpaper of his bedroom—its dull gold matched his memory of light in the Pacific. Soon two walls were covered with shapes that recreated his memories of Tahitian lagoons, where he had visited 30 years earlier. A tracing was taken and sent to a printer in London who made an edition of 30 screenprints on tough linen. Not all survived but fortunately one edition of Oceania, the Sky is preserved in the National Gallery of Australia, along with a folio of paper cut-outs made the following year, which Matisse called Jazz. Many sheets in the folio refer to highly practised circus acts that Matisse related to personally. Sword swallowing, the trapeze, knife throwing—all balanced on a knife-edge between success and disaster. And, of course, Pierrot the clown, whom Matisse thought of as the artist’s alter ego. For both, the gift of giving pleasure is hard won but must appear spontaneous, effortless and full of joy—no matter what the cost. Research and discuss the impact of Islamic arts on western art. Identify the principles of Islamic art. Research and discuss how Henri Matisse’s artworks were influenced by Islamic art. Discuss Matisse’s influence on the pattern painting style of the 1970s. Discuss the meaning of positive and negative space in a work of art, and review the principles of design: balance, emphasis and unity. Create a collage using cut black and white paper utilising positive and negative space. One colour accent may be added for emphasis and centre of interest. For both this activity and the next, ensure that you are able to discriminate between foreground and background, and that the positive and negative shapes are balanced. Matisse created shapes cut out from brightly colour papers and arranged them on another sheet of construction paper. 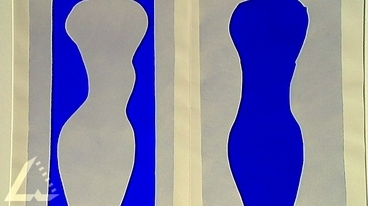 These images were then printed by silk screening techniques. With Matisse’s artwork in mind, use the serigraphy method to create a silkscreen print.